It sounds simple enough. Just place five consecutive stones in a vertical, horizontal or diagonal line. Sort of like Tic-Tac-Toe, right? 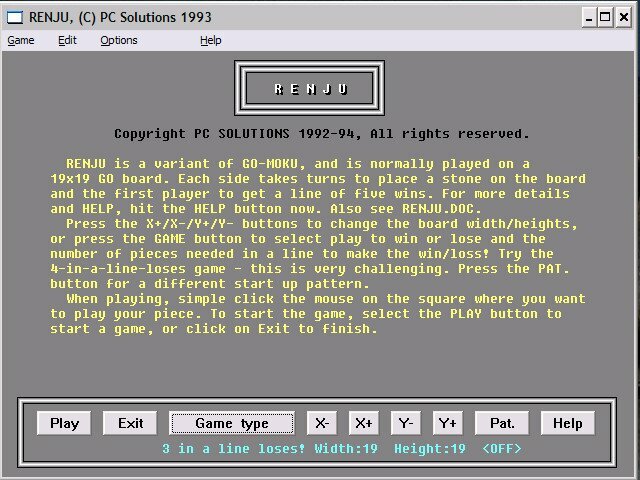 Renju, a variant of the popular board game Pente, is one of those deceptively simple strategy games that turn out to be diabolically complex. First off, there are 225 spaces on the game board; plenty of choices, and lots of ways to make a wrong move. And the game provides a tough AI. 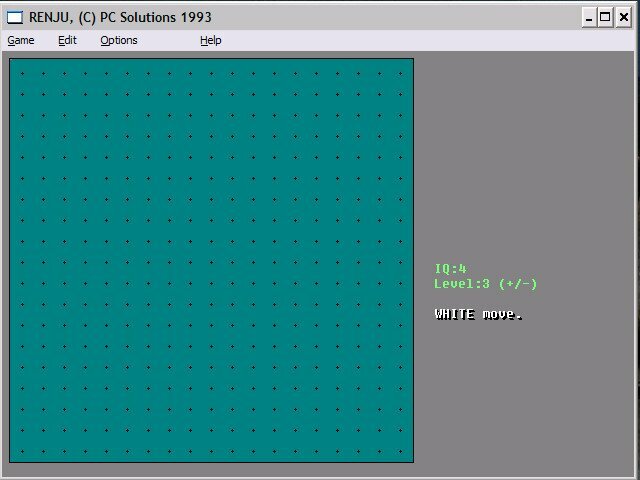 There are ten difficulty levels, but most players should find the middle levels challenging enough to keep them interested for quite a while. 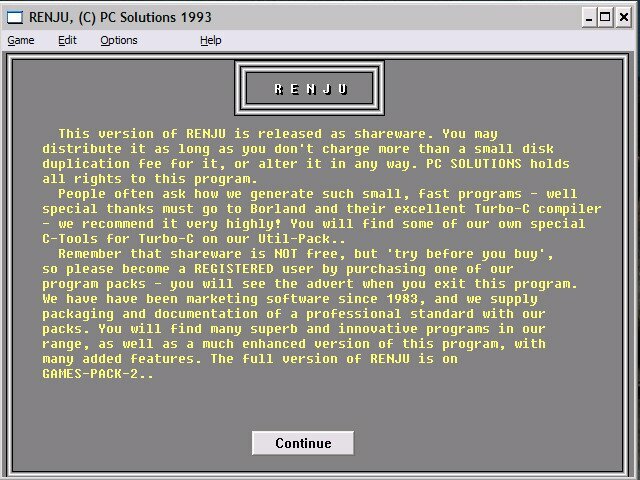 Like most pure strategy games, Renju doesn’t have much in the way of graphics or sound. But it does provide many of the features you’d find in a good chess program. 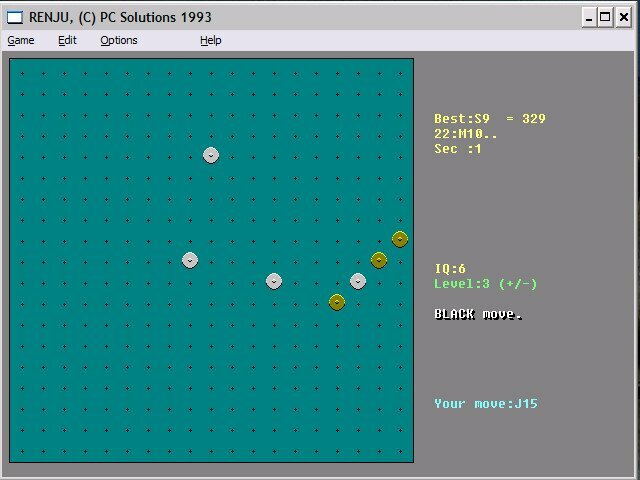 The computer can suggest a move or display illegal moves, and you can take any number of moves back, rotate the board or change the background color, and save positions to disk. Turning off the computer’s “random” function forces it to always make the same move in any given situation, which means you can replay a tough game as many times as it takes to figure out where you went wrong. Renju isn’t the most advanced game design around, though, so don’t look for the kind of polish and features you’d expect from a more established software publisher.